C-DOT has developed a Broad Band Wireless solution keeping in mind the growing data needs of the rural India that is called Public Data Office (PDO). It is developed on same line of Public Call Office (PCO) to serve the common public. A VLE (Village level Entrepreneur) can easily setup a Wi-Fi infrastructure at any place with C-DOT PDO where Ethernet or Wi-Fi backhaul is available and start providing Wi-Fi service to users. VLE can generate voucher of different denominations as per requirement of local users. Wi-Fi user can purchase voucher to access the Wi-Fi service. Voucher is directly sent to users at their mobile and eKYC is done by OTP. 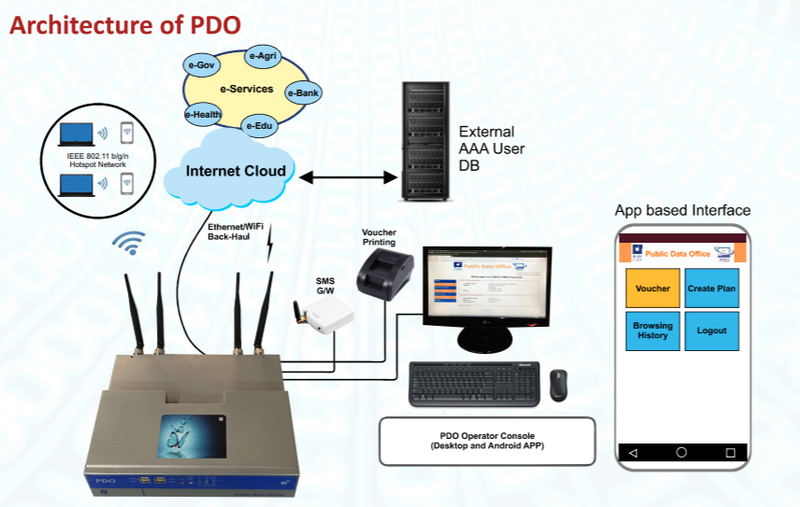 PDO in standalone mode can be used in University campus, hotels and private premises. Computing Hardware : Based on C-DOT thin client board Wi-Fi Hotspot : IEEE 802.11 b/g/n 2.4 GHz (20/40 MHz bandwidth) with 150 Mbps Data rate and 2X2 MIMO Dual Backhaul : 1 – Ethernet Port 10/100 Mbps and Point to Point from nearest POP over Wi-Fi Configuration : Indoor Unit with indoor or outdoor antenna Authentication : Open/WPA/WPA2/WPA-Enterprise, 802.1x/EAP (Local or Central AAA database) Operation Standalone: User Friendly Web Based GUI or Android based APP Software Standalone Mode: • Captive Portal with configurable landing page • Controller, AAA database, Voucher Generation, Management & Distribution (sms or print) • Billing: Volume based, Time based, Bandwidth based all are at PDO.